Government warehouse in Sittwe township with prepositioned relief items. Jakarta, 2 February 2018 – The AHA Centre deployed the ASEAN Emergency Response and Assessment Team (ASEAN-ERAT) personnel to Myanmar on 15 – 31 January 2018. The team members were tasked to assist the work of the Relief and Resettlement Department (RRD) of Myanmar. The two ERAT members who came from the Philippines and Singapore, as well as one staff of the AHA Centre, have returned from their two-week mission. The deployment of the ASEAN-ERAT personnel covered three agendas: i) observing the status of ASEAN’s relief items that had been provided through the AHA Centre; ii) supporting the Emergency Operations Centre (EOC) of RRD in information management, secondary data analysis, and report writing; and iii) preparing for the next ASEAN-ERAT Induction Course that is taking place in Myanmar this year. Part of the mission included a two-day field observation to Rakhine State. Based on the field observation, the ASEAN-ERAT members affirmed that the relief-items distribution report from RRD is in line with the team’s observation. Previously between October 2017 and January 2018, the AHA Centre facilitated the provision of 80 tonnes of relief items, which were sent in two batches from its regional stockpile in Subang, Malaysia. In December 2017, additional relief items were locally procured by utilising a S$100,000 contribution from the Government of Singapore. The ASEAN-ERAT members also observed that the Government of Myanmar had prepared temporary shelters for the displaced communities in Rakhine and those that may return from outside Rakhine. The temporary settlement is equipped with clean water as well as pre-positioned aid such as clothes, food, and kitchen sets. 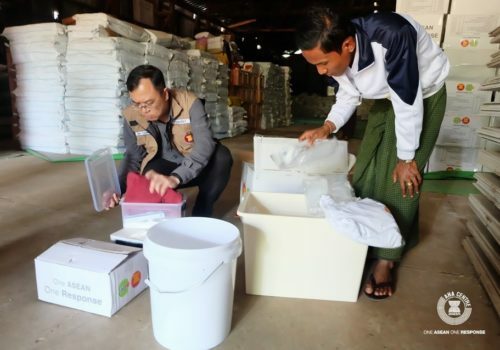 In addition to the existing efforts, the Government had stored contingency relief items in Sittwe and Maungdaw in anticipation of future events such as flooding in the upcoming monsoon season. Throughout their mission, the ASEAN-ERAT members closely worked with the Director-General and staff of RRD, including with the Myanmar Red Cross, the General Administration Department in Rakhine, and the Fire Services Department in Nay Pyi Taw, Yangon, and Rakhine. The team conducted a needs assessment and devised recommendations to further enhance the on-going provision of humanitarian assistance to the affected communities in Rakhine State. “The AHA Centre would like to thank the Government of Myanmar for welcoming our ASEAN-ERAT members to work in Nay Pyi Taw and Rakhine State. The mission demonstrates ASEAN’s solidarity, helping one another in times of difficulties, under the spirit of One ASEAN One Response,” said Adelina Kamal, Executive Director of the AHA Centre. coordination amongst ASEAN Member States and with relevant United Nations and international organisations in promoting regional collaboration in disaster management. The AHA Centre is based in Jakarta, Indonesia. ASEAN-ERAT is a rapidly deployable response team to support the affected ASEAN Member States during major sudden and slow on-set disasters. The members of ASEAN-ERAT come from ten ASEAN Member States and managed by the AHA Centre. The ASEAN-ERAT is designed to support National Disaster Management Organisation (NDMO) of the affected country during the initial phase of disaster emergency and can be deployed at a short notice. To date, ASEAN-ERAT consists of 222 trained personnel from all ASEAN Member States. ASEAN-ERAT has been deployed 22 times in 7 ASEAN countries over the past ten years.